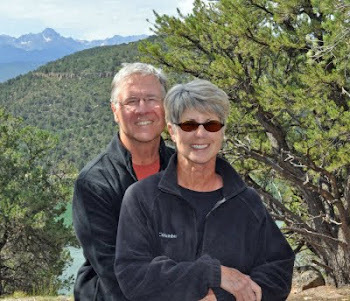 Find us on Google+ Rick and JoAnne's RV Travels: Oct 10, 2010 Altitude in Texas! After a relaxing morning, we moved on to our next adventure in RVing! Our 1st stop was the Odessa Meteor Crater – billed as “The Phenomenon From Out of This World”…well, I am sure it was 50,000 years ago but now it has filled in with sand and rock and you can “kind of” see where the rim of the crater was. Guess you don’t know until you stop to see it! We were going to stop at the “Museum West of Pecos” however it was closed, but it did give us a chance to see the absolute desolation and bad condition of Pecos. Most everything we saw in the “downtown area” was vacant, boarded up, and nasty. Heartbreaking!!! Moving on – we arrived at the Davis Mountains State Park in Fort Davis, Texas. Whew! How surprisingly wonderful!!! Elevation 5,000’ - Fort Davis is the highest town in Texas. Tomorrow we will explore the area, and the Fort…however…tonight was exciting!!! What a fun and fantastic ending to our day! Caleb says: "Wow! That is a cute animal. I've never seen such a thing!" Hope you are having fun!